UK-based Antonia Bolingbroke-Kent is an itinerant adventurer and a travel writer. Her first book, Tuk-tuk to the Road: Two Girls, Three Wheels, 12,500 Miles was an account of how she and a friend drove a tuk-tuk from Bangkok to the UK. She followed up with A Short Ride In The Jungle: The Ho Chi Minh Trail By Motorcycle, her account of seven weeks she spent discovering the Ho Chi Minh Trail, alone, on a bike called The Pink Panther, because of its pretty pink spray job. Although Antonia is wary of giving details, her next book, too, will be an account of a motorcycle ride through an area of Asia little-known in the West. In the meantime, she is currently visiting South East Asia, to write a magazine article about biking northern Thailand’s Mae Hong Son Loop, famous amongst bikers for being a route with 762 bends. I met her over a cup of tea in Singapore. 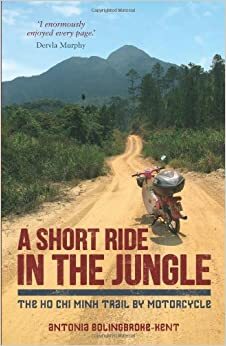 The paperback print edition of A Short Ride In The Jungle, published by Summersdale, is widely available in Asia, priced in local currencies. The eBook is available through Amazon UK.